What is the Old Pear Deck Editor? Why is it being sunsetted? When is it being sunsetted? How will Pear Deck support me through this change? Will I be able to create new Pear Deck files? Will I be able to present and access my old Pear Deck files? Will I be able to edit my old Pear Deck files? How can I move my old Pear Deck files to the new format? What happens with slides that had student canvases? What happens with slides that had AsciiMath syntax? The Old Pear Deck Editor was app where Pear Deck teachers originally logged in to create interactive Pear Deck slides. We built the Pear Deck for Google Slides Add-on to make it easier for teachers to add Pear Deck interactivity directly to their Google Slides files. After we built the Add-on, we saw how much easier it was for many teachers to use and nowadays, very few people use the old Editor. First and foremost, the technology we use to create the Pear Deck files in Google Drive is being sunsetted by Google. But, we also think the Add-on is much easier for teachers to use. It makes it easy to format slides just how you want while still getting the Pear Deck interactivity. It also comes with our pre-made template library, making it even easier to drop in formative assessments, reflections, and bell ringers. This works closely in alignment with our mission to make it easier for teachers to hear from each student every day. The Old Pear Deck Editor will be officially sunsetted on December 1st, 2018. We have a converter, so you can easily convert your old Pear Deck files into Google Slides format with your Pear Deck interactive questions fully intact. That’s right! One click, and your files will be ready to use in Pear Deck for Google Slides Add-on format. This converter will automatically display when you open a Pear Deck Editor file. Click here to learn about this magic converter. We will always answer your questions through our help desk. Just email help@peardeck.com. Yes! To create new Pear Deck Slides presentations, you will use the Pear Deck for Google Slides Add-on. Our Add-on is a sidebar in Google Slides. You get to edit your slides with all the formatting features you are used to in a slides editor, but you get the extra bonus of all of our interactive questions! It really is a Perfect Pear. Will I be able to present and access my old Pear Deck files made in the old Editor? Yes! Even after the Old Pear Deck Editor is sunsetted, you will still be able to Present those old files. Will I be able to edit my old Pear Deck files made in the old Editor? Yes, but! You will be able to edit your old files by converting them to Google Slides format. You will not be able to edit old Pear Deck files in the Old Pear Deck Editor. How can I move my old Pear Deck files to the Pear Deck for Google Slides Add-on format? ...with our handy dandy magic converter! When you convert, all of your interactive questions will automatically be transferred. You will be able to edit these converted slides in Google Slides with the Pear Deck for Google Slides Add-on. Click here to learn about the converter. We recommend reviewing your converted slides before presenting so you can make any necessary tweaks. In the Pear Deck Editor, it was possible to create a Drawing or Draggable Slide that showed instructions on the Projector View while giving students a different canvas to Draw or Drag upon. In our Google Slides Add-on, it is not possible to have a separate canvas. Instead, students Draw or Drag directly upon the main slide content. So! How will this kind of slide convert from the Old Editor into the Add-on? When we convert this kind of slide, we will make 2 slides in the Add-on. The first slide will show the main content and will not be interactive. The second slide will show the student canvas and will be interactive. You can decide to leave it as two separate slides or to combine the content and the canvas onto one slide. We always recommend reviewing your converted slides before presenting so you can make any necessary tweaks. 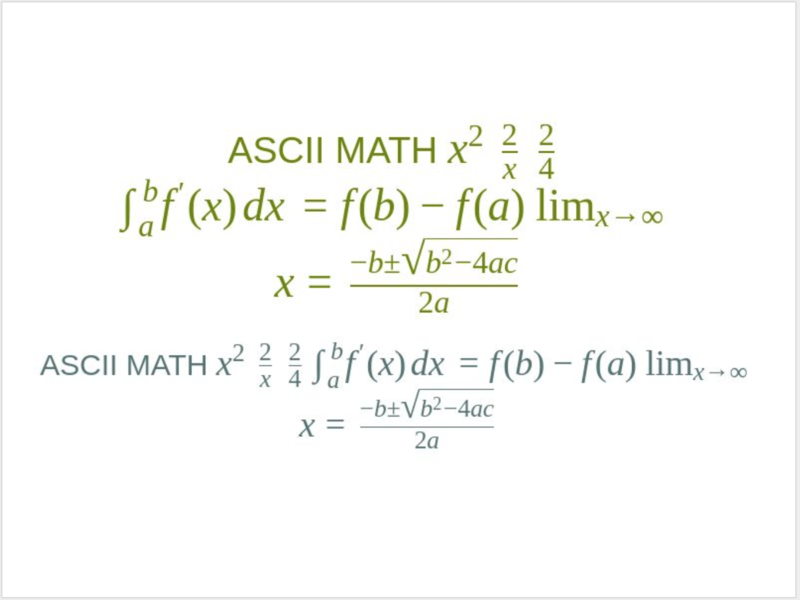 If you used AsciiMath in the Old Pear Deck Editor to create math equations, you might wonder how that will transfer in to our Google Slides Add-on. 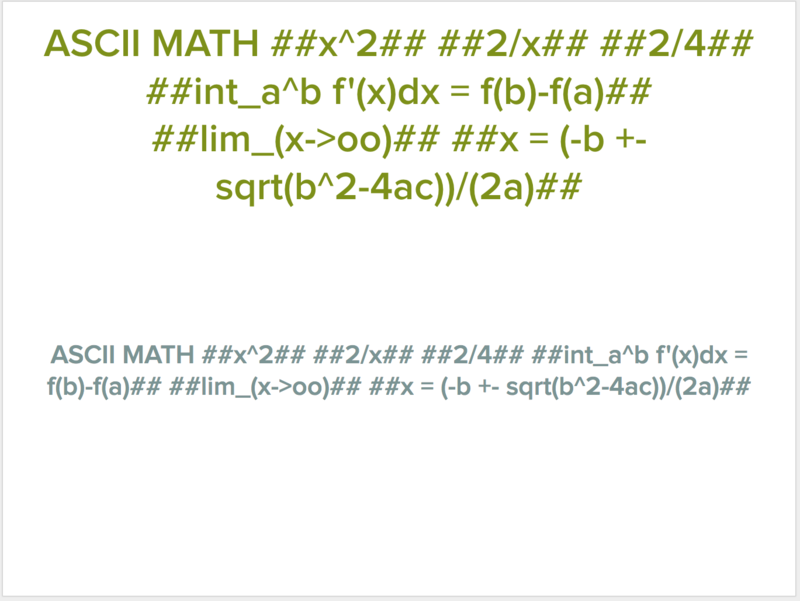 In the Pear Deck Editor, when you typed in AsciiMath syntax, like this ##4^2##, we automatically rendered it nicely when you presented. But, when we go to convert your slides with this syntax, we face this question: Would the teacher rather have the formula render nicely? Or would the teacher rather have the original syntax so they can alter the formula? We decided both options were important. The second slide contains the AsciiMath syntax. That way if you need to change the formula or want to paste it into another equation-maker, you can. It looks like this. Notice that these are text boxes and you can alter the text. You can delete either slide you don’t need or skip over the one you don’t need when presenting.